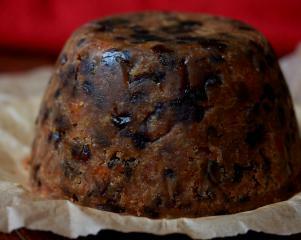 This traditional christmas pudding is best served hot with custard. Make at least a week before for the best flavour. Makes a one litre pudding. Combine the sultanas, currants, raisins, orange zest, peel and brandy in a bowl and leave for 2 hours for the fruit to soften. Beat together the margarine and sugar. Stir in all the other ingredients. Grease the pudding bowl very well. Place a circle of baking paper in the bottom. Pour in the mixture. Place another circle of baking paper on top. Cover the top of the pudding bowl in tin foil and tie it on with string. Fold the tin foil up so that it doesn’t touch the water. Place the pudding bowl in a pan large enough to comfortably hold it. Add enough for water to come up to two thirds the side of the bowl. Put the lid on and put onto a medium heat. The pudding needs to steam for three hours, check the water level every 30 minutes. When it has steamed a cake skewer will come out cleanly.